[CONT](VC):During your turn, if this unit is in Legion, and the number of cards in your soul with “Dimensional Robo” in its card name is three or more, this unit gets [Critical]+1. [AUTO](VC):[Counter Blast (1)] When this unit’s drive check reveals a grade 3 card, if your Legion Mate’s [Critical] is two or greater, you may pay the cost. If you do, choose one of your opponent’s guardians, retire it, and that unit’s effects with “cannot be hit” is nullified. [CONT](VC) Limit Break 4 (This ability is active if you have four or more damage):During your turn, if the number of cards in your soul with “Dimensional Robo" in its card name is three or more, this unit gets [Power]+2000/[Critical]+1. 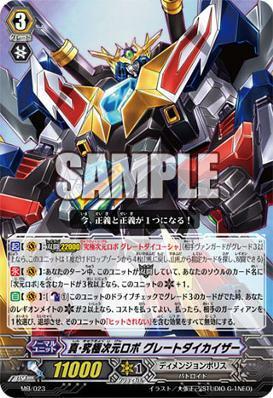 [CONT](VC/RC):If you have a non-«Dimension Police» vanguard or rear-guard, this unit gets [Power]-2000. 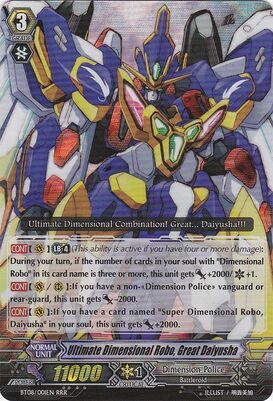 [CONT](VC):If you have a card named “Super Dimensional Robo, Daiyusha" in your soul, this unit gets [Power]+2000. Bushi in charge of weird as f*** rulings.